George, a tailor aged 27 in 1851, the brother of Edward John/James Adams, a jeweller, discussed in ‘Common Surname Trouble – Adams in Birmingham’, was my hope to identify the next generation back. A convincing case can be made from 1861-1891 census enumerations that a tailor named George Adams, born ca. 1824, married Elizabeth after 1851 and raised a family. 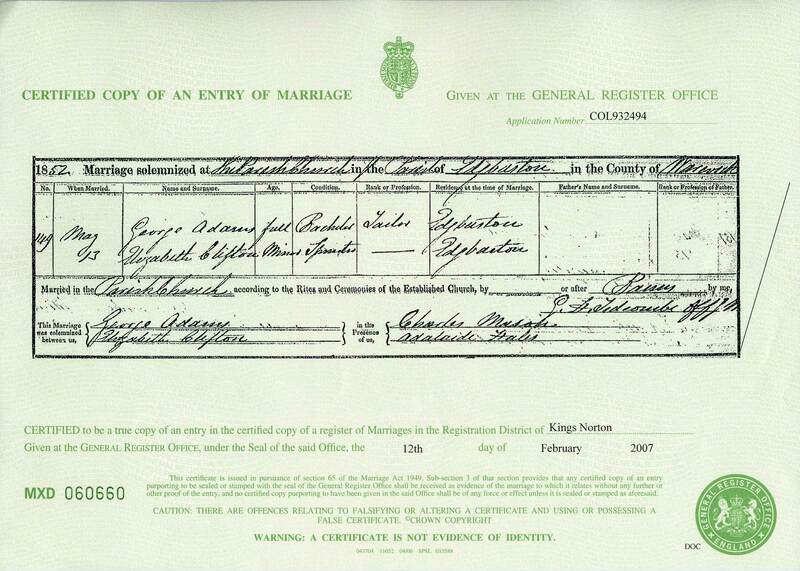 The civil registration of the marriage should give me the name of George’s father. Elizabeth’s age ‘minor’ indicates that she was under 21, which fits the Elizabeth in the census. Her age consistently indicates a birth date of ca. 1833, so she was 19 or 20 at the time of the marriage. George’s occupation as a tailor fits, but the age ‘full’ does not confirm he is the right George. Were there other tailors named George Adams in Birmingham? The nineteenth century method of googling a tradesman was to consult a trade directory, which were usually published annually. Some entries were free, but many were paid for, so trade directories did not include every business. The ‘UK, Midlands and Various UK Trade Directories, 1770-1941’ collection on Ancestry looks promising. However, Ancestry does not give a list of the directory titles included, so I can’t assess the relevant coverage of the collection. The data is derived from a third party company that scans old books, produces indexes using optical character recognition (OCR), offering the result on CDs and online subscriptions, Midlands Historical Data. OCR is not completely accurate and renders some text as gobbled gook, which has been transferred into the Ancestry database. Consequently, some entries will not be found. I would like to search on the street address to check for entries missed and confirm someone else occupied premises before and after my target, but Ancestry’s search does not accommodate this search. On the 1901 census Elizabeth was a tailor and her son, Ernest Clifton Adams, was a tailor’s assistant. So, the 1903 directory listing indicates the business was still in operation, not that George had been resurrected! Elizabeth probably died in 1904 (FreeBMD death index, 1904 Jan-Mar quarter, Birmingham, Vol 6d, page 84), which is consistent with no further entries in the Handsworth area. The tailor in Sparkbrook, on the other side of Birmingham, is clearly a different person. Taken together, the census and trade directory information support one another and give a career history for George. Even though the evidence is indirect and I have not searched the records as thoroughly as I would have liked, I am reasonably convinced this George is the brother of Edward John/James Adams. A possible candidate for George, aged 18, on the 1841 census, resided in Steelhouse Lane with probable Adams relatives, Sarah (aged 60), Alexander (20), Phoebe (16), Catherine (11), William (7), Sophia (4) and Fanny Plant (11). Unfortunately the 1841 census does not give relationships and only approximate ages. Sarah could be the mother of Alexander, George and Phoebe, but not the younger household members. So Edward John/James Adams’, father was possibly James Adams and George Adams’ mother might have been Sarah. Maybe I should look for baptisms for children of James Adams and Sarah. Big Maybe.